The incendiary bombs of ork Burna-Bommers proved catastrophic to the Imperial attackers. Meanwhile, guardsmen say, the ork warlord and several mobs of Boyz swept around the Imperial flank and quickly overran two squads of infantry and some hastily redeployed Sentinels. Imperial and ork units clash near the highest ruins as the battle wore on. The battalion finally deployed a strong firing line, survivors say. But ork aircraft—irreverently called “Burna-Bommers” by the troops—swept over the battlefield and unleashed a torrent of incendiary bombs. Scores of guardsmen were burned to death in the attack. Ork warriors march down suburban streets with impunity, as the mishandled PDF fails to form an effective firing line. To his credit, observers say, Captain Karalis was resolute in his courage. Standing atop his command Chimera, he was bellowing orders to the troops when ork aircraft swept overhead—and consumed his vehicle (and the officer himself) in flaming promethium. The battle didn’t last long after the battalion commander’s death. As the main ork attack struck the Imperial front line, a number of Killa Kans and Deff Dreads turned the flank. Caught between these forces, much of the rest of the battalion was slaughtered—with few survivors managing to flee to safety. By the end of the battle, Imperial troops were in full retreat. The trooper died moments later. Much of the information about the battle was gathered by reporters as retreating troops returned to Imperial lines. Soon after, however, commissars arrived to restore order, and reporters were escorted at gunpoint away from the front lines. There are rumors that troopers who spoke to reporters were summarily executed. Burna-Bommas proved a powerful new addition to the ork arsenal. Imperial leaders fear that the xeno invaders are winning the fight for air superiority. Imperial authorities say the citizenry has been enthusiastic about enlisting in the PDF—and that the 3rd Battalion will be rebuilt and new recruits will return the shattered unit to full strength within the month. “I reassure the citizens of Hegira that there is no cause for alarm,” General Vectrix said in a later vox message to the public. 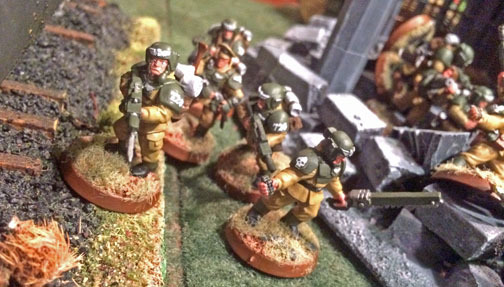 The ork advance was ragged and disorderly … yet far more effective than the PDF advance. TheGM—I was so looking forward to a “City of Death” fight. Then I discovered that, after two years of traditional scenarios, I had no idea how to fight a battle where I couldn’t easily bring my firepower to bear. I made more mistakes than I can count. I had only the vaguest plan, and that fell apart on Turn One when I realized I couldn’t get my infantry in position to fire in time. I only added to my troubles by falling back and surrendering the initiative. I found I’d compounded my mistake with the wrong mix of weaponry and troops. I assumed an urban fight was best fought with infantry (not entirely wrong), but I failed to prepare for any tactical situation. When The Gaffer showed up with a Burna-Bomber and Deff Dreads, I was poorly equipped to deal with the threats. But the biggest mistake was my generalship. I was tentative. I sat back and tried to hold off the orks with firepower, but I bunched up my troops so much that the orks could concentrate their assets against me. I also failed to exploit the greenskins’ weaknesses. Only grots held Objectives #5 and #6, and if I’d rushed at them—or sent my Sentinels to that flank—I could have knocked those units out of the game (or forced the orks to send Boyz to the rescue). The Gaffer gave me a proper scolding at battle’s end. It’s fun to win a battle, but, for my opponent, I think this fight was like whipping a frightened puppy. No as much fun. One of my worst efforts of the campaign. TheGaffer-The GM is a little hard on himself. When you’re in a concrete corridor and Smaug shows up, the situation will resolve itself to a natural conclusion. This was our first city fight and neither of us had a good handle on the rules. The only strategy I could come up with was to look through the unit types and max out on flame weapons that negate cover. After that it was do what orks do best; either attack ‘ard and fast, or attack ‘arder and fasta! Upon further reflection, it looked like the GM did not know what to do because there wasn’t anything he could do. We found that our building models, though very pretty to look at, were not designed well for gaming. There was no real way to deploy troops onto firing positions and many windows were bricked up for some reason. On top of that, we did not have enough buildings to limit avenues of approach. There was plenty of room for the orks to maneuver. This episode in the Hegira Campaign will inspire a number of articles on the philosophy of gaming. Primary Objectives: Two objectives worth d3 v.p. in two highest buildings; four other objectives worth 1 v.p. Secondary Objectives: First Blood, Behind the Lines, Kill the Warlord. Ork Tactical Objectives: Kill an enemy unit in the open, Place a friend unit in the enemy deployment zone. Some troopers successfully used the ruins to advance with stealth, but those in the main column marched to their doom as if they were on a parade ground–totally unprepared for the monstrous assault awaiting them. Orks: Two primary objectives (2+2 v.p. ), three secondary objectives (3 v.p.) Kill the Warlord (1 v.p. ), First Blood (1 v.p. ), Behind the Lines (1 v.p. ), two tactical objectives (Kill in the Open) and (Friendly Unit in Enemy Deployment Zone) (2 v.p.). Total: 12 v.p. Click here to return to the start of this ignoble Imperial defeat. The Corvus Cluster is a Warhammer 40K blog that documents our gaming adventures in Games Workshop’s sci-fi universe.